On Jan. 31, 1958, the United States had their first successful satellite launch with Explorer I. The satellite was designed and built by the Jet Propulsion Laboratory (JPL). located near Pasadena, California. The launch occurred from Launch Complex 26 located at the Cape Canaveral Missile Range, now known today as Cape Canaveral Air Force Base, at 22:48 EST (0348 GMT Feb. 1st). It was lifted into orbit by a Juno I rocket provided by the United States Army. 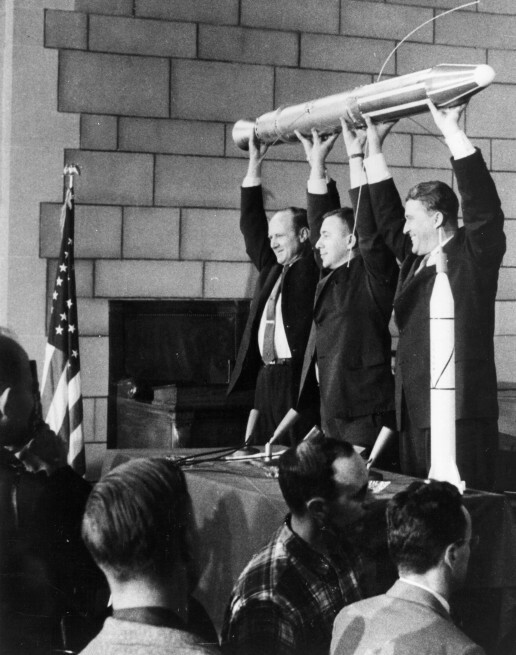 The launch was in honor of the International Geophysical Year and marked the formal entry of the USA as a serious competitor with the Soviet Union. 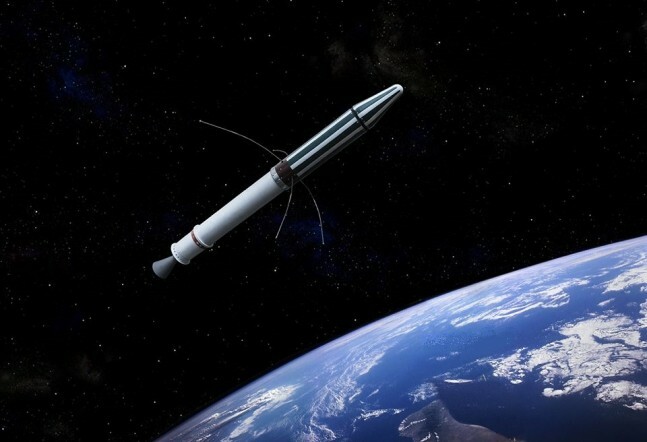 The Soviet Union had launched Sputnik I the previous year, and already followed up with Sputnik II marking the beginning of what was to be known as the “Space Race.” The USA had previously attempted to launch a satellite of their own using the Navy Vanguard rocket. The attempt resulted in a spectacular explosion on the launch pad during a live television broadcast. The press quickly dubbed the name of the doomed satellite “Kaputnik.” Because of this failure, JPL and the U.S. Army rocket team, led by Wernher von Braun, was asked to quickly come up with a new satellite and launch it into orbit. The JPL team was led by Dr. William H. Pickering. Due to the weak lift capability of the Army’s Juno rocket compared to the Soviet Union’s R-7 rocket, Explorer I weighed only 30.8 lbs. (13.37 kg) vs Sputnik I’s initial weight of 184 lbs. (83.6 kg). This low weight forced the JPL designers to set goals for the design that emphasized simplicity and high reliability. The satellite was built in just 84 days. Explorer I was equipped with two main science instruments; a cosmic ray detector designed by Dr. George Ludwig, and three different types of micrometeorite detectors. The entire scientific package was overseen by the University of Iowa and led by Principal Investigator Dr. James Van Allen. After reaching orbit, Explorer I gave scientists an opportunity to study movement and rotation of satellites, especially momentum-preserving energy dissipation which was totally unexpected. Micro meteor impacts were detected by two of the three instruments. Cosmic rays were also detected, but when the satellite reached an altitude of more than 2,000 km, the count would go to zero. Van Allen hypothesized that the zero count resulted from the detector being overwhelmed with cosmic rays and that there must be a “belt” of highly-concentrated cosmic rays at this altitude surrounding the Earth. Explorer III confirmed this hypothesis and the belts were named after Dr. Van Allen. Explorer I continued to provide data until the batteries died on May 23, 1958. The satellite remained in orbit for more than 12 years. JPL not only designed and built the satellite, but provided the course and trajectory calculations from their unique computer department. At that time, JPL did not have physical computers, but called their mathematicians “computers” whose job was to compute these problems. What made the division more unique was the fact that it consisted of only women, some straight out of high school. Barbara Paulson, of the JPL computer division, was assigned to the operations center tracking the satellite, plotting its orbit using the data from the object and from a tracking station. (1) The unexpected energy dissipation (damping) was produced by flexing of the four small whip antennas. This caused the spacecraft to go, within its first orbit, from a spin about its long axis to an end-over-end tumble. A paper that explained the physical mechanism was written soon after by Prof. R.N. Bracewell and his grad student Owen Garriott (the future astronaut). (2) Human “computers” in those days operated mechanical calculating machines to implement the algorithms that were developed by the mathematicians/analysts. (I once read a paper by Alan Turing in which he talked about the analyst having to “liaise” with the computer: this confused me until I realized that he meant a human computer!) Far from the JPL group being unique in having mainly women computers, this was the usual situation. Thank you for the additional insights Trevor.